You don’t have to spend a fortune on quality coolers. In fact, the hard or soft small coolers I have ever bought kept perishables cold for days. Don’t think that’s possible? The key is using dry ice. I am cautious, so the beginning was a bit of a learning curve. However, I wouldn’t go back to using any other kind of ice on my long journeys and I bet you won’t, either. Measuring the cooler will help you determine how much dry ice you can fit inside. This cooling gas comes in blocks and pellets, and I recommend purchasing blocks for the longest lasting results. Remember, each 24-hours requires 10 pounds to 20 pounds of dry ice to keep the perishables cold. If you have a cooler between 40 and 60 quarts, it can hold 10 pounds of dry ice at a time. 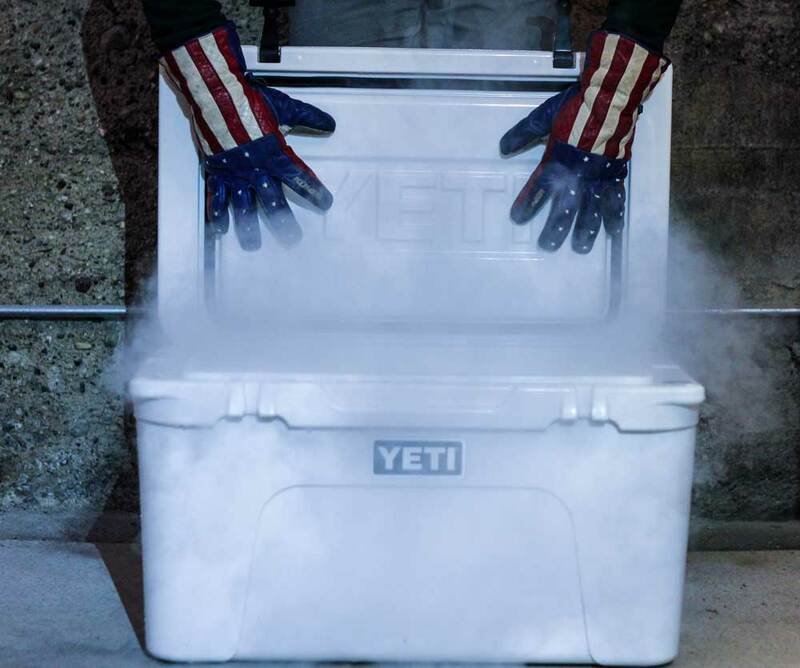 The interior of the cooler can be damaged if it comes in contact with dry ice, so it’s important to protect it. Wherever the ice could touch should be protected, whether that is the top, sides or bottom. After wrapping the dry ice in newspaper, I suggest using cardboard or Styrofoam to create extra space. Additionally, loosen the cap of the drainage hole. This will prevent gas from building up and damaging the integrity of the cooler. Make sure to put on gloves before handling dry ice. You can also use towels, but be careful. If the dry ice comes in contact with your bare skin, it could burn. Also, warn your guests not to touch. You can always place a piece of cardboard with a small hole cut in the middle on top of the dry ice. If there are children present, it might be best to get out their food and drink for them. Dry Ice on Bottom or Ice on Top? Before you pack your cooler, decide whether you want to place the dry ice on the top or bottom. When placed on the bottom, it will keep food and drinks cold. When placed on the top, it will quickly freeze the food around it. There are some other tips, tricks, pros and cons to the question of ice on top vs. ice on bottom. If people will be reaching into the cooler frequently, storing the dry ice on the bottom is the way to go. Since you are only aiming to keep the food and drink cold, make sure there is cardboard or a few layers of newspaper so anything touching the dry ice won’t freeze. Keep leftover papers on hand to crumple up and fill in gaps between items. Want to create a freezer? Put the dry ice on the top instead of the bottom of the cooler. Let the newspaper-wrapped dry ice sit directly on top of the food you want to freeze. However, this makes it inconvenient to get in and out of the cooler quickly. I’ve found dry ice does best on top when I’m storing only food and keeping a separate cooler for only drinks.